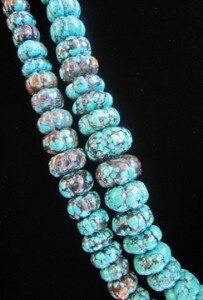 Formed as water flows around rocks in sunny, desert lands, turquoise has come to symbolize both water and sky. From Cerrillos to China to the Middle East, the people who found it, mined it, polished it and wore it believed it empowered them with the promise of safety, health and plenty. McBrinn’s lecture offers tantalizing hints to an exhibition of the same name opening this spring at the Museum of Indian Arts & Culture. Admission to the event is $5 at the door, and seating is limited. Cash or check only, please. Friday through Sunday, the shady Palace Courtyard will play host to a variety of exhibitors offering geodes, fossils, opals, turquoise and more for sale. Entry is free through the Blue Gate south of the History Museum’s main entrance on Lincoln Avenue. Some of the most knowledgeable miners and collectors in the Southwest will share important tips in casual al fresco lectures. Jewelry-making workshops will be offered each day for $20. 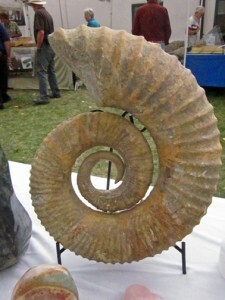 9 am to 5:30 pm: Palace Gem & Mineral Show open in the Palace Courtyard. 6 pm: “Turquoise, Water, Sky.” Maxine McBrinn, curator of archaeology at the New Mexico Museum of Indian Arts & Culture, speaks in the History Museum Auditorium. $5 at the door. McBrinn is currently developing Turquoise, Water, Sky, a spring 2014 exhibit about turquoise in the Southwest for the Museum of Indian Arts & Culture. She has conducted archaeological field work in Colorado, Wyoming, and Texas, but primarily in New Mexico. She is the author, with Linda Cordell, of Archaeology in the Southwest, Third Edition (2012, Left Coast Press). 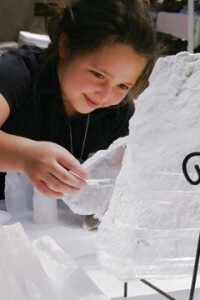 9 am to 4 pm: Palace Gem & Mineral Show open in the Palace Courtyard. 10 am: Opal cutting and polishing demonstration by Sandy Craig. The owner of Orca Gems & Opals in Littleton, Colo., has been cutting and polishing the gems for over 20 years, along the way developing special methods for getting the most out of a given piece of rough opal. See how he turns what looks like a forgettable stone into a glittering jewel. 11:30 pm: “History of Fakery in Gemstones: Questions You Should Ask Before Buying,” by Garrick Beck. The owner of Natural Stones in Santa Fe will give a talk about the history of pulling the wool over consumers’ eyes with stones that have been dyed, synthesized, stabilized and enhanced, and teaches you four things to ask before buying gemstones. 1 pm: “Copper Mining in New Mexico,” by Gregory Jaekel. The co-owner of Star Mountain Trading Company in Silver City talks about the history of copper mines and their byproducts, turquoise. Noon: “History of Fakery in Gemstones: Questions You Should Ask Before Buying,” by Garrick Beck. The owner of Natural Stones in Santa Fe will give a talk about the history of pulling the wool over consumers’ eyes with stones that have been dyed, synthesized, stabilized and enhanced, and teaches you four things to ask before buying gemstones. The New Mexico History Museum’s assistant collections manager, Pennie McBride, recently hit a major milestone, successfully rehousing the final object in the History Museum’s clothing, accessories and textile collection. It marked the end of a five-year effort that represented one of the primary reasons we needed to build a 92,000-square-foot museum: We needed a better place to store all our stuff. In 2005, an Institute of Museum and Library Services awarded the museum a $140,000 grant to rehouse the 3,406 items in the textiles collection – a group that ranges from wedding dresses to purses to rugs. 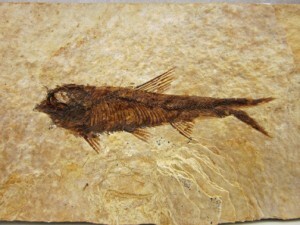 The grant lasted until 2009, though work continued into this summer. The grant helped hire a textile conservator and train staff, volunteers and interns how to handle, treat and rehouse the objects. First, the items had to be moved from the old Armory Building to the Halpin Building and then, in 2009, to the new museum. How big of a job was that? We’re talking along the lines of 296 shoes, 275 hats, 20 parasols, 47 floor coverings, 153 pieces of underwear, 67 fans, 27 art samplers, 32 U.S. flags of various starriness and more. 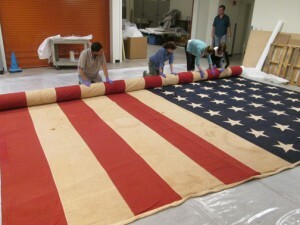 With the volunteers, McBride created padded hangers, cut and pieced together boxes, built mounts for hats and fans, stuffed shoes and boots, and entered every item’s details into a new database—all of it a build-up to one giant flag. Next up: Photographing all 3,406 pieces. But first, a moment of relief.